The Wild Wild West was an American television series that ran on CBS for four seasons 1965 1969. Two television movies were also made with the original cast in 1979 and 1980, and the series was adapted for a motion picture in 1999 with a new cast and story. 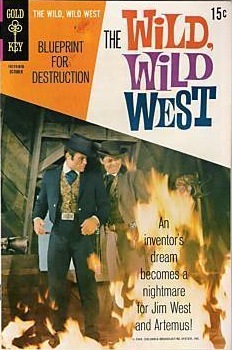 Pictured here is a copy of the Wild Wild West #7 from Gold Key from the 8.5 Bethlehem pedigree with Robert Conrad on the cover. This comic is newsstand fresh and looks and feels like a brand new comic with a very small impact dent bottom left corner. The was the last issue with the Wild Wild West and is a very valuable sought after collectible. Take a look at some more wild west vintage comics to start or complete your collection.